A micro-tentacle developed by Iowa State engineers spirals around an ant. Engineers at Iowa State University developed spiraling microrobotic tentacles that can gently grip delicate objects. 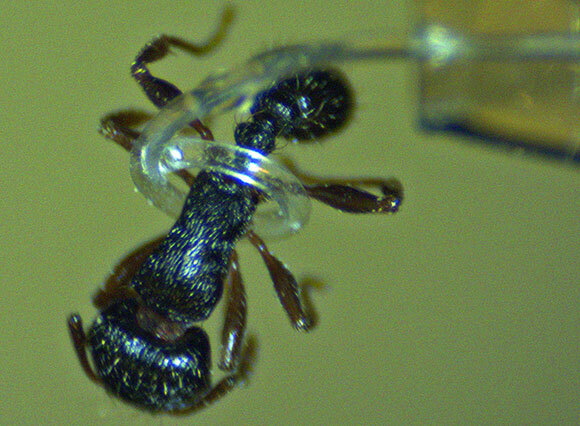 The tiny tube circled an ant’s thorax, gently trapping the insect and demonstrating the utility of a microrobotic tentacle developed by Iowa State University engineers. And that makes them perfect hands and fingers for small robots designed to safely handle delicate objects. The spiraling microrobotic tentacles are described in a research paper recently published in the journal Scientific Reports. Kim is the lead author. Co-authors are In-Ho Cho, an Iowa State assistant professor of civil, construction and environmental engineering; and Jungwook Paek, who recently earned his Iowa State doctorate in electrical and computer engineering and is moving to post-doctoral work at the University of Pennsylvania in Philadelphia. Jaeyoun (Jay) Kim holds a syringe with a micro-tentacle attached. 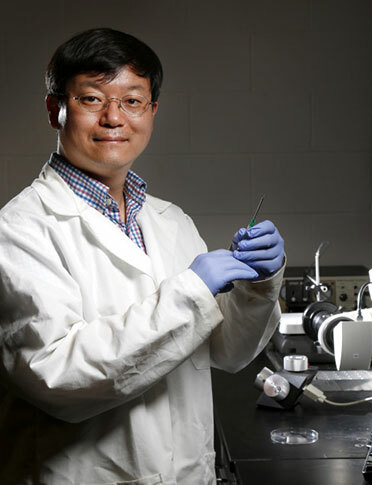 Behind Kim is the system of nozzles, micro-manipulators and microscopic cameras developed by his research group to shape soft, rubbery PDMS material. The paper describes how the engineers fabricated microtubes just 8 millimeters long and less than a hundredth of an inch wide. They’re made from PDMS, a transparent elastomer that can be a liquid or a soft, rubbery solid. Kim, whose research focus is micro-electro-mechanical systems, has worked with the material for about a decade and has patented a process for making thin wires from it. The paper also describes how the researchers sealed one end of the tube and pumped air in and out. The air pressure and the microtube’s asymmetrical wall thickness created a circular bend. They further describe how they added a small lump of PDMS to the base of the tube to amplify the bend and create a two-turn spiraling, coiling action. It took a lot of problem solving to create the extra turn in the microrobotic tentacles. “Yes, we scratched our heads a lot,” Kim said. The engineers had to develop new production techniques to create the microtubes. They had to figure out how to peel the microtubes off a production template. And they had to use computer modeling to find a way to create more coiling. Kim said the resulting microrobotic tentacle is “S-cubed – soft, safe and small.” He said that makes it ideal for medical applications because the microrobotic tentacles can’t damage tissues or even blood vessels. The current study was supported by Kim’s six-year, $400,000 Faculty Early Career Development Award from the National Science Foundation. Be the first to comment on "Engineers Develop Micro-tentacles So Tiny Robots Can Handle Delicate Objects"